Because of fallout form Saint Marys Place Holiday Inn project, a better project management process was deemed neccessary. October 11, 2017 PB: What's the vision for Saint Marys Place subdistrict? PB Reporting: "A Destination Medical Center rendering provides a potential look at the future St. Marys Place. Community input is being sought this week as a final design concept nears." Of the 5 sub-districts, Heart of the City and Discovery Square are positioned as priority for Phase 1 of DMC. However, being responsive to market conditions, as development proposals come forward, the DMC EDA process adjusts. Saint Marys Place is receiving attention and rolling out a concrete engagement process. 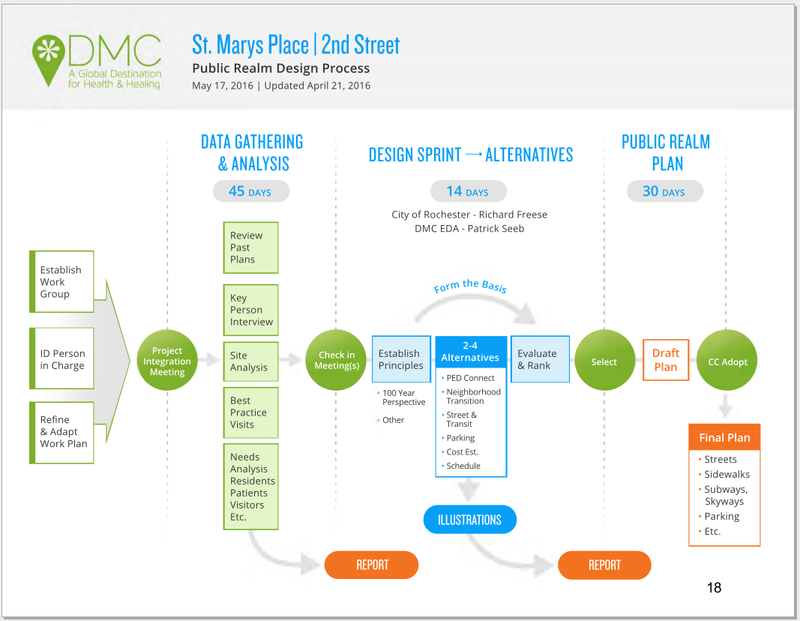 Now that Saint Marys Place has a project design and evaluation process. And that's good. But why not extend the same or similar process to other DMC sub-districts? All sub-districts should follow similar process steps.